But I saw a scrapbook page! 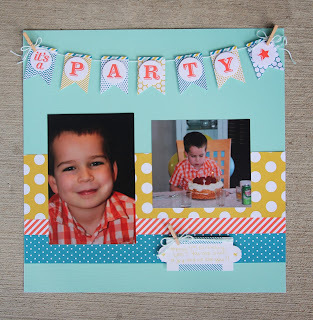 Using the kit, it was very easy to whip up this double layout scrapbook page. 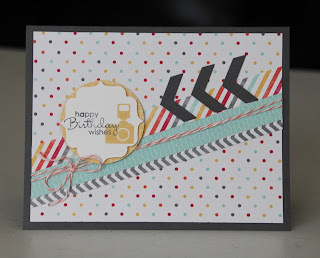 I added retired Designer Series paper that matched, cut out a number 4 and the tag for the journaling. Other than that, everything else was from the kit. Super easy, simple and fast! Zack loves to play with Michael's iPad. He plays educational games for the most part and really enjoys it. We usually let him play for a bit on the mornings that he's not at school. I found him snuggled up with Giraffe and giggling to himself over a "really funny monkey" as he informed me. 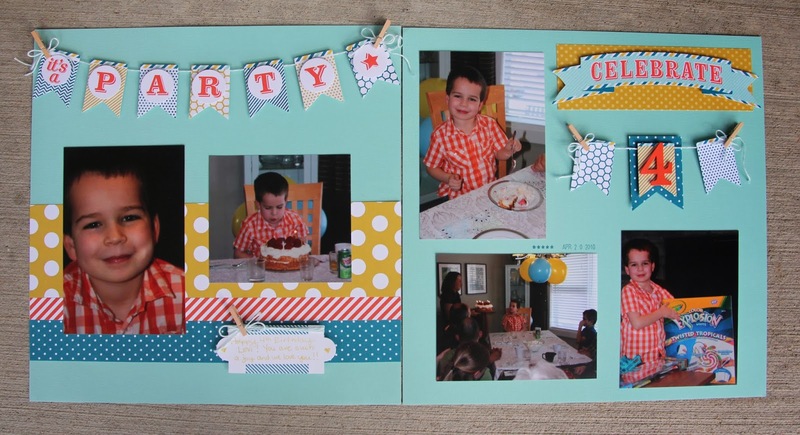 Jakob celebrated his birthday with his friends from school last Thursday. It was a record breaking hot day, so it was the perfect day for a beach party! The kids played, swam, ate snacks and cupcakes. It was a really, really great afternoon. 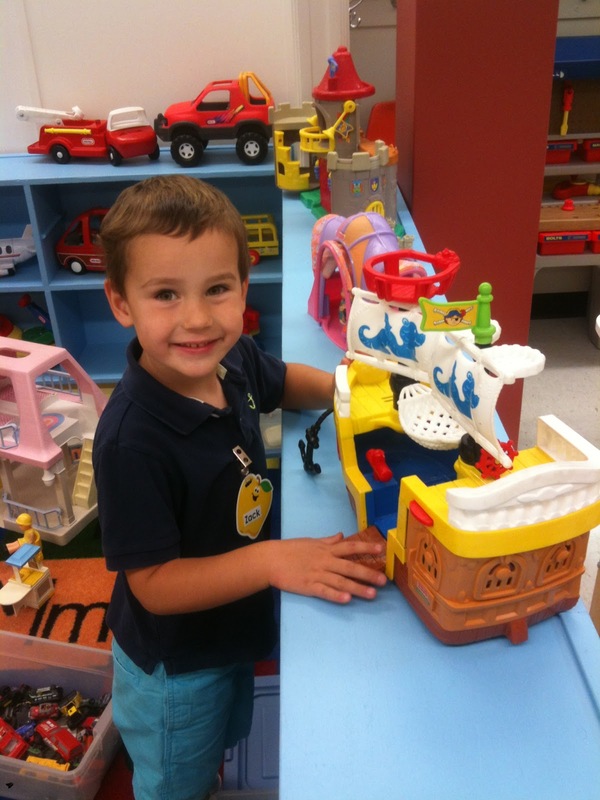 Jakob had so much fun! 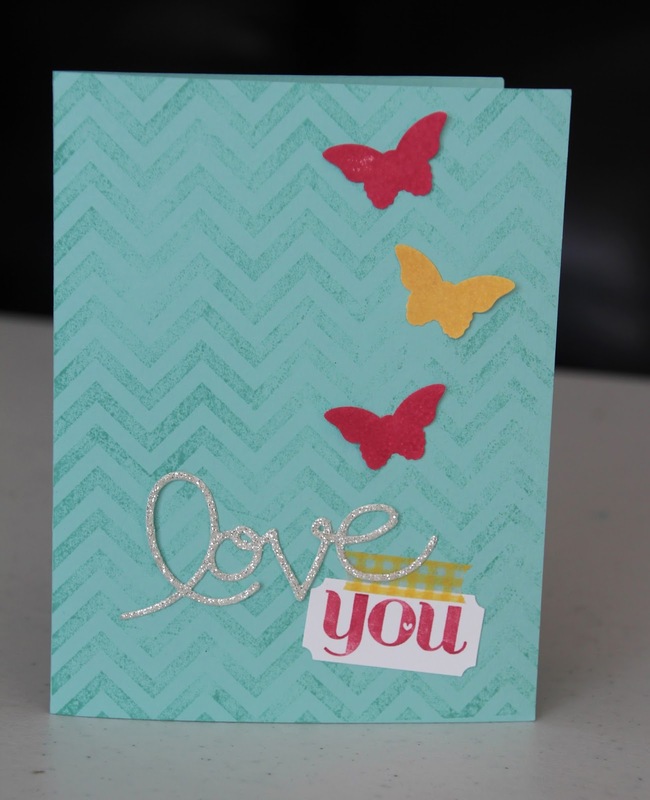 Today I am sharing the cards that we made at my monthly card club. 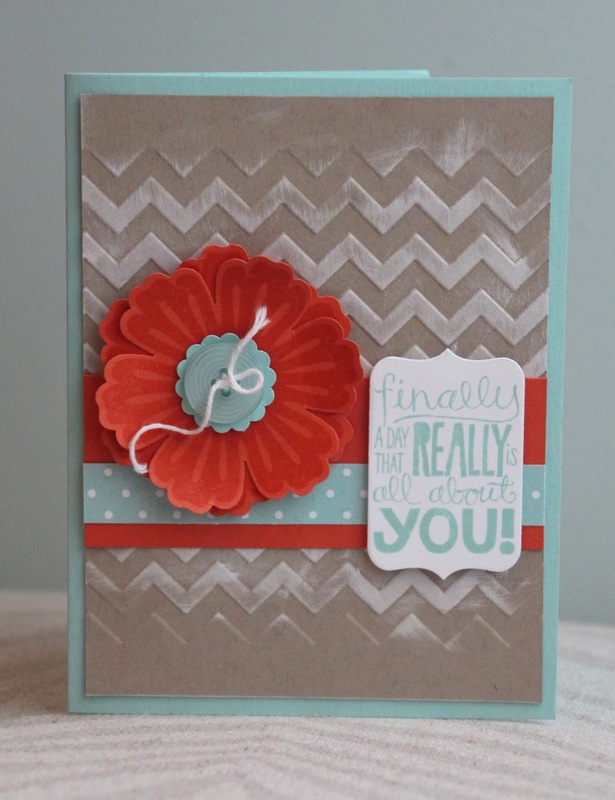 This first card was taken straight from Stampin' Up! 's website. I made a few very minor changes, but for the most part, it is the same. I love the colors on this card - Soft Sky, Crushed Curry, Chocolate Chip, Sahara Sand and Tangerine Tango. This second card is probably one of my favorite cards that I've ever made. Chevron and butterflies - 2 of my favorite things!! 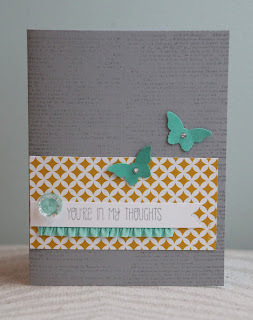 The last card that I have to share today is a simple card using the "I Am Me" designer series paper. This paper is so bright and fun - great for birthday cards! 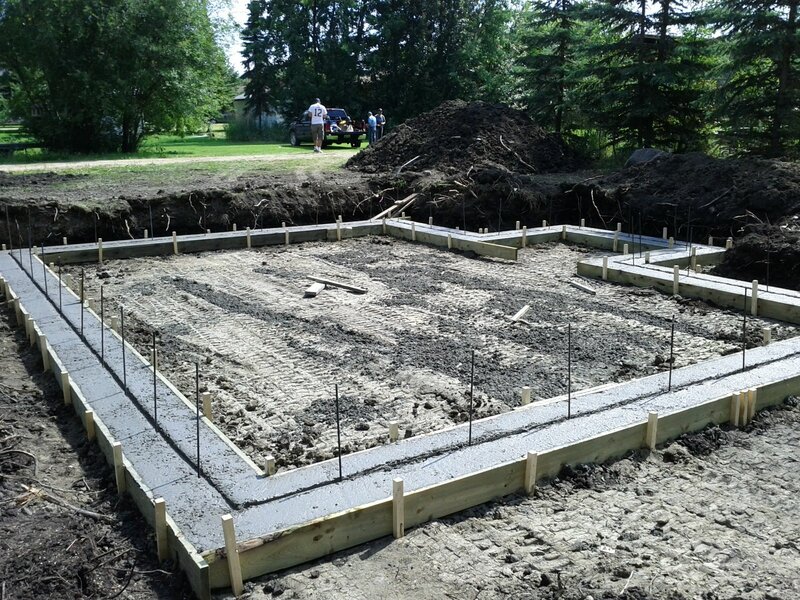 The cabin is on the foundation!! 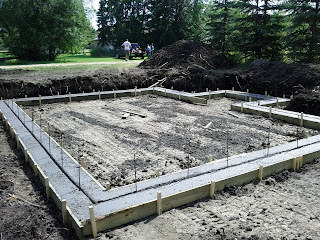 My Dad, Mom, Opa H, Jordan, Michael and Uncle Jerry worked very hard the last 2 months to get the cabin onto the basement foundation. My Dad is the one of the hardest working guys I know! He has been out at the lake weekly, on his days off, working and general contracting the cabin build. Thanks Dad!!! Michael took Jakob and Levi out to the lake one of the days that he went to work on the cabin. While he worked, they worked on their tree fort. There it is - on the basement foundation! Lots and lots of work ahead of us as we put in new windows, redo the roof and put vinyl siding on the exterior. Zack loves playing in the bushes! That evening after everything was done, we made a fire, roasted hot dogs and had supper by the lake. The boys had a great time wrestling and playing! This baby card was made for my cousins new baby. His room colors are Basic Grey, Daffodil Delight and Coastal Cabana. Aren't those colors so cute together!? 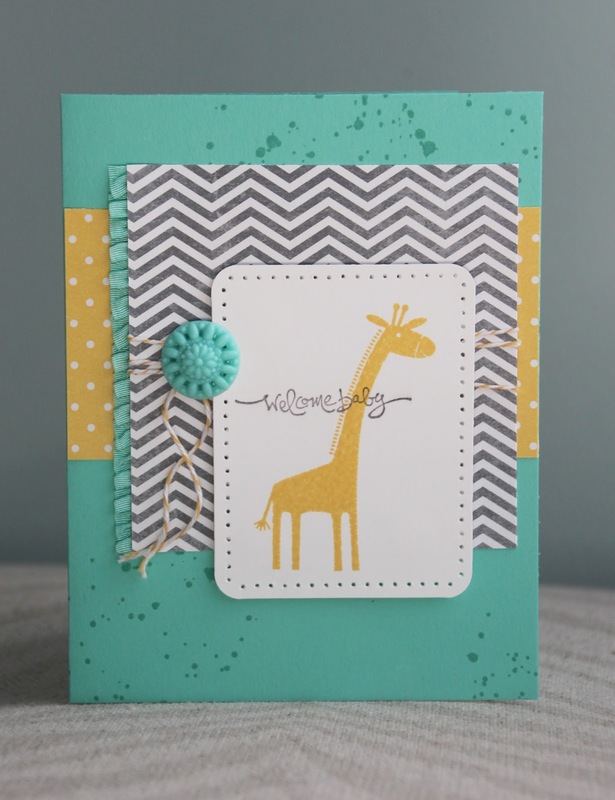 I love the new Zoo Babies stamp set, so that was my starting point for this card. Of course, I added some chevron DSP and Gorgeous Grunge - my go to set! All 3 boys had their first day of school on Tuesday. 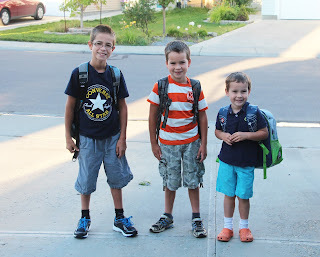 Summer was fun, but everyone was ready for school to begin! 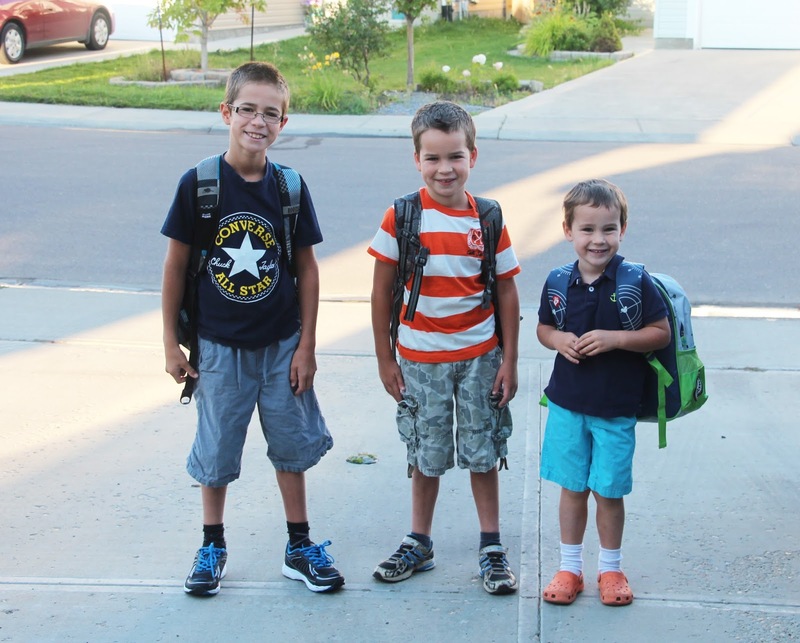 3 back packs, ready to go. 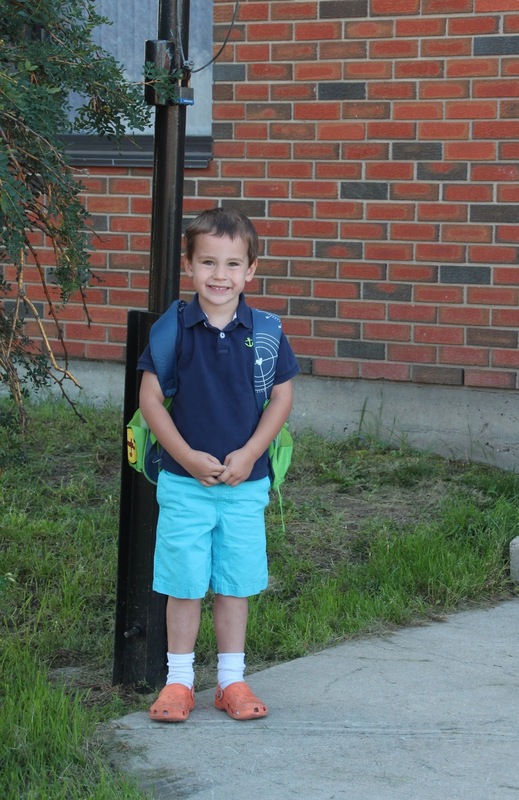 Everyone is excited for their first day! 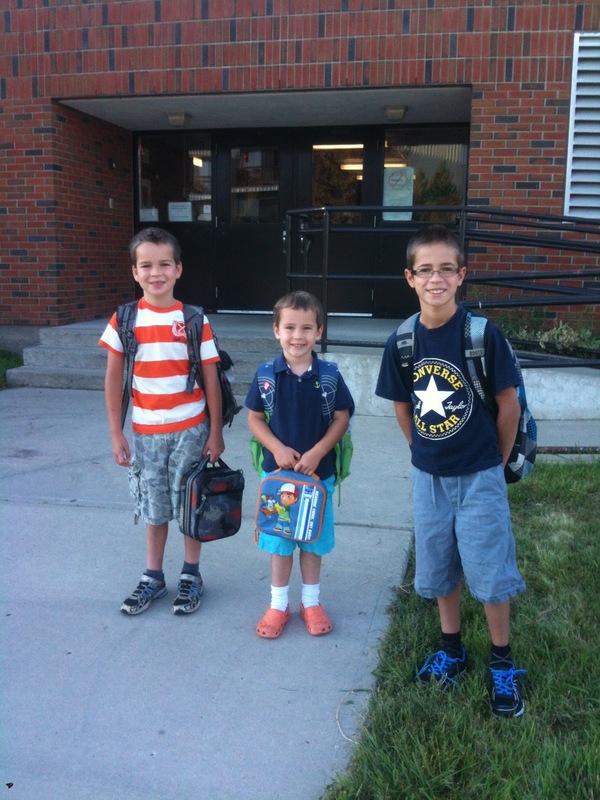 All 3 boys are in the same school, hooray! 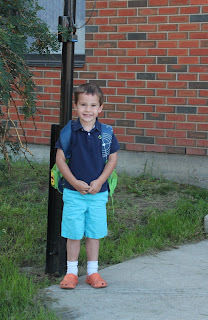 I'm so happy that he had a great day of school and is excited to go back again! 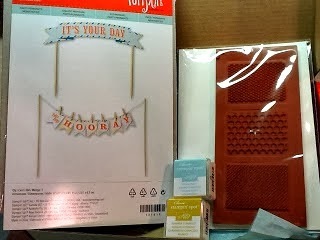 Today I am sharing my Stamp Club cards from August. This month's "theme" was working from a sketch. The same sketch was used to create all 3 cards below. First up is a Smoky Slate, Coastal Cabana & Crushed Curry color combination. 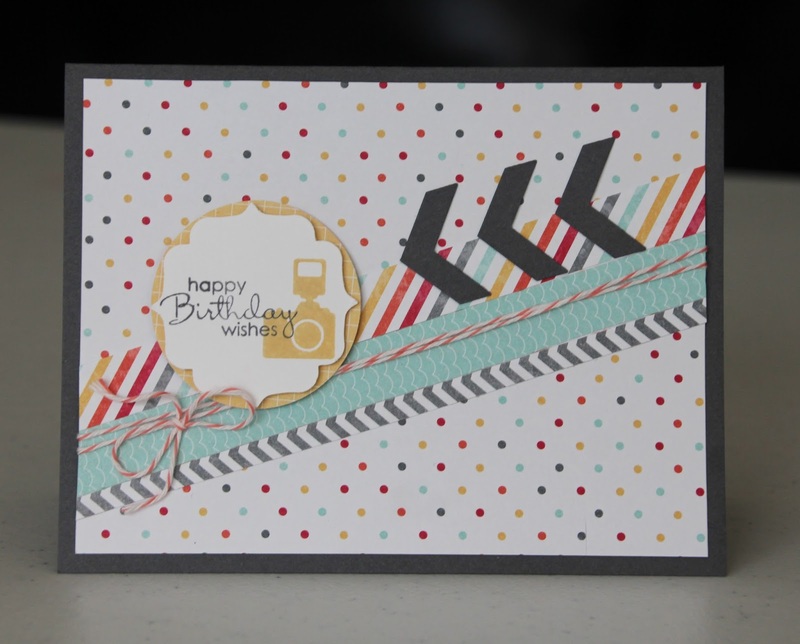 The Dictionary background stamp and Eastern Elegance Designer series paper were a big hit with this card! I love the feathers on this card! 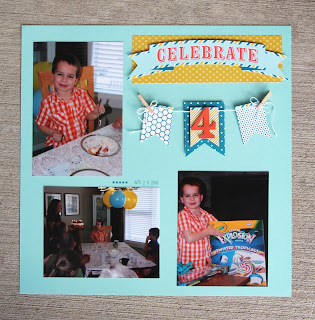 They were so easy to make - grab any circle punch, punch out a circle and then punch off an oval from one of the sides. Fold the oval in half and cut fringes partially through. Notch out a few sections to give it a worn look. You can use any card stock and stamp on it if you would like, or any DSP works great too. Super easy! This last card has the most steps to it, but it's totally worth it! The background is my favorite part of this card - first emboss the paper with the Chevron embossing folder, then lightly run your white ink pad over the raised part of the embossing. 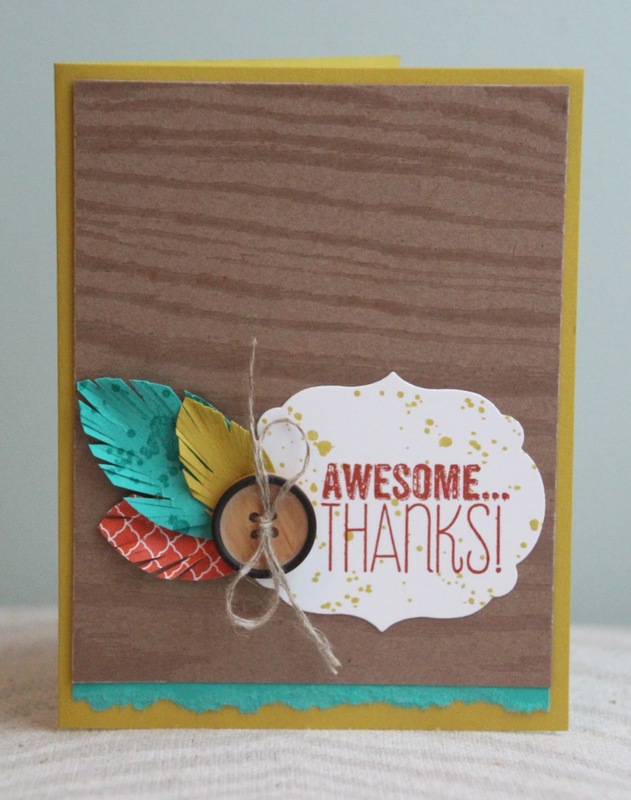 It really gives the card some dimension and adds interest!